Αρχική › POSTS IN ENGLISH › BIOGRAPHIES › BERU KHYENTSE RINPOCHE. Brief biography. BERU KHYENTSE RINPOCHE. Brief biography. His Eminence Palpung Beru Khyentse Rinpoche (or Dzongsar Khyentse Chokyi Wangpo) was born in 15/6/1947 in Nyethang region of Central Tibet (25 km from Lhasa), as the second incarnation of Jamyang Khyentse Wangpo one of the most important illuminators of Buddhism in Tibet. 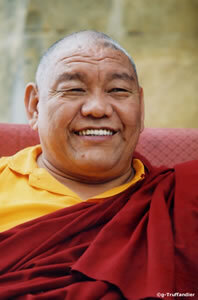 Rinpoche is a renowned master of Tibetan Buddhism and in particular of Rime and Kagyu lineages and holder of many other secret tantric transmissions. He is the father of the 4th Jamgon Kongtrul Yangshi. The appearance of Jamyang Khyentse Wangpo, emanation of Bodhisattva Manjushri, was prophesized by Guru Rinpoche while the appearance of Jamgon Kongtrul Lodrö Thaye (1813-1900), emanation of Bodhisattva Chenrezig (Avalokiteshvara), was prophesized by the historical Buddha Sakyamuni. They were equally responsible for each other’s line of transmission, where they acted as guru and disciple to each other. Both are masters of the non sectarian Rime movement and, in those days, they were the famous pioneers of all eight lineages of Tibet. Jamyang Khyentse Wangpo lived from 1820 to 1894 and his basis was mainly at Dzongsar Trashi Lhatse. With his unsurpassable learning and realization gained through study, practice and visions, was not confined to sect or school and he propagated the Dharma impartially to all. Before he passed away Jamyang Khyentse Wangpo prophesized that he will reincarnate in multiple forms in order to support Rime movement and to benefit more beings. So several reincarnations or emanations of Jamyang Khyentse Wangpo appeared, including those of body, speech, mind, qualities and activity, were recognized in Tibet. In the same way Jamgon Kongtrul Lodrö Thaye, who had passed away in 1900, manifested many reincarnations throughout all the lineages. Some of them were recognized by the 15th Karmapa Khakyab Dorje. Thus the speech emanation of Jamyang Khyentse Wangpo became the 1st Beru Khyentse (1896-1945) Karma Jamyang Khyentse Özer, son of the King of Beru Gönpo Düdul in Kham (eastern Tibet). He was later enthroned at Palpung Monastery, which became the seat for all his activities. His birth was prophesized by Jamgon Kongtrul Lodrö Thaye at the age of 84. He had many non-sectarian disciples from Sakya, Gelug, Kagyu and Nyingma traditions. Just to name a few eminent ones from the Kagyu school were, the 15th Karmapa (he was both his Guru as well as his disciple), the 16th Karmapa, Nenang Pawo Rinpoche, Khyabje Kalu Rinpoche, Khandro Orgyen Tsomo (consort of the 15th Karmapa). It should be mentioned that the latter two reincarnations of Kongtrul and Khyentse were main disciples and successors of the 15th Karmapa. The 1st Beru Khyentse Rinpoche passed away at the age of 50 and Karshe Kongtrul Rinpoche passed away at the age of 52. The 2nd and recent Beru Khyentse Rinpoche Chokyi Wangpo was born in central Tibet in 1947. He was found and recognized after having followed the instructions given by the 16th Karmapa Rigpe Dorje and enthroned as a young monk in 1955. At the age of fourteen he led his monks and lay disciples from his monastery in Nangchen out of Tibet, where he established a community for them, including a monastery and a retreat center in Mainpat, India. He then received the traditional training given to reincarnated Lamas (Tulkus). He completed the extensive studies in Buddhist philosophy and became a Khenpo and received all the transmissions of Karma Kagyu lineages such as Karma Kamtsang, Shangpa Kagyu etc, the Kalatsakra Tantra, the Sakya tradition and many more from several other Lamas, among which were H.H. The 16th Gyalwa Karmapa, H.H. The Dalai Lama, H.H. Dilgo Khyentse Rinpoche, H.H. Sakya Trindzin, Dzongsar Khenpo Chimey Rinpoche, Khyabje Kalu Rinpoche, Khunu Rinpoche. After completing the traditional four-year retreat in the Karma Kagyu tradition, Rinpoche established monasteries in Bodhgaya (Karma Dhargye Chokhorling Monastery), in Kathmandu and the Nangchen monastery, nunnery, institute and three-year retreat center in Tibet. Rinpoche rebuilt the Sakya monastery, Nyenthang Tashigang, near his birthplace in Tibet and founded the Tharjay Charitable Foundation to sponsor bridges, schools, clinics and medical treatment for the nomads of eastern Tibet. He is the father of the 4th Jamgon Kongtrul Yangshi, who is one of the two emanations that the 3rd Jamgon Kongtrul manifested after his death in 1992. Born in 17.12.1995 in Nepal he was recognized by H.H. The 17th Karmapa Trinley Thaye Dorje and traditionally enthroned in 2000 and is now receiving the Tulku training by his father. Since 1979, Beru Khyentse Rinpoche has traveled tirelessly to many countries around the world to perform dharma activities. These countries includes, Australia, New Zealand, Malaysia, Singapore, Bangkok, Indonesia, Hong Kong, Philippines, Taiwan, China, France, Germany, Austria, Italy, Switzerland, England, Denmark, Norway, Sweden, Poland, Russia, Hungary, Spain, Holland, Belgium, Greece, Lebanon, Kuwait, Canada, North America, South America, Bhutan, India, Nepal and Rinpoche’s motherland, Tibet. In all of these countries Rinpoche has visited the major cities, towns and villages to spread Dharma in a manner suitable for all students from beginners to the most advanced practitioners. Many of the Dharma centers and Buddhist communities in these countries invite Rinpoche repeatedly to give teachings, empowerments, refuge vows and Bodhisattva vows. So far, more than twenty thousand people have become Buddhist practitioners and over a hundred and fifty thousand people all over the world received blessings, dharma teachings and empowerments from Beru Khyentse Rinpoche. ‹ CHIGSHE KUNDROL ATHENS 2011, Which empowerments will be given.